NIGERIA: NNAMDI KANU MUST BE RELEASED IMMEDIATELY! Nnamdi Kanu is a British citizen who has been in detention since 14 Oct. 2015 in Abuja at the request of the president of Nigeria Gen. Muhammadu Buhari despite numerous court orders demanding his immediate and unconditional release. Kanu is political prisoner for campaigning for the right to self determination of the Indigenous People of Biafra. Nigeria’s secret police knows as DSS kidnapped and detained Nnamdi Kanu upon his arrival in Lagos on 14 Oct. 2015 from London. He was falsely accused of treason and held incommunicado at the orders of President Buhari who vowed never to release him despite courts of competent jurisdiction ruling that he should be set free. 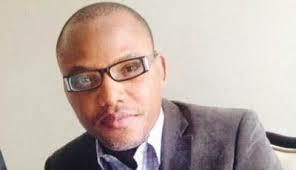 Kanu is a vocal human rights activist and leader of Indigenous People of Biafra (IPOB). Nnamdi Kanu is a Prisoner of Conscience and must be freed immediately and unconditionally!